At Pain Physicians NY (Brooklyn, Queens, Bronx, Manhattan NYC) hip flexor strain pain management doctors and specialists effectively treat all grades of hip pain. Brooklyn hip pain management specialists are selected to be a part of the international medical team for the Rio Olympic Games. A hip flexor strain refers to an injury affecting any of the hip flexor muscles that leads to pain in the hip region. Hip flexor muscles are responsible for facilitating movement of the legs by transferring movement from the lower abdomen. 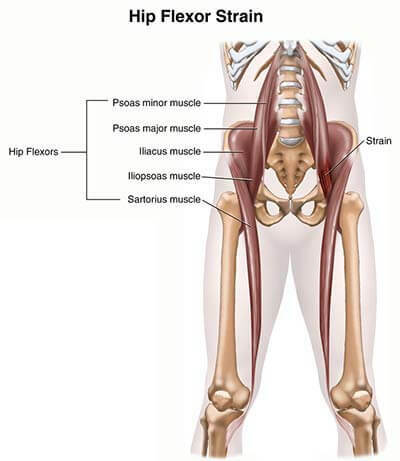 The iliopsoas, for example, is a muscle that connects the pelvis to the femur, and when it contracts, enables the knee to bend towards the chest. However, these muscles may become torn due to repetitive movement or excessive strain, which leads to a hip flexor strain injury. The extent of the damage will depend on the cause of the injury, which can be minimal, causing a slight tear or extensive, leading to a rupture of the hip flexor muscle. The extent of the damage varies, and so do the symptoms, ranging from mild and discomforting pain to severe and debilitating pain across the hip. What causes a hip flexor strain? Injuries to hip flexor muscles are most common in sports such as football and running in short dashes. The repetitive straining of these muscles during a game or practice session can lead to minor tears of the muscle. A more significant tear can be seen when the individual makes a sudden contraction of the muscle from a stretched position. This can be seen when a football player makes a very powerful kick when they had not done adequate warm up and stretching. Besides sports players, an individual with weak muscles may experience slight tears to their hip flexor muscles by making sudden contractions of the hip or by performing rigorous exercises after a very long time. Direct trauma, too, can cause the problem, such as that caused by a lap seat belt during an accident. The main sign of a torn hip flexor muscle is the pain, but this pain will vary depending on the extent of the damage. The pain is usually felt along the front of the hip and sometimes radiating down to the thigh. A slight tear can cause mild pain that is simply uncomfortable, but most of the time it may be a cramp that makes the individual limp while walking. In some cases, the muscle may be completely torn, causing severe pain and swelling of the hip and thigh. In these cases, it will be difficult to walk and the area may even become bruised. Managing these injuries does not require clinical attention but may instead be done by the individual at home. The first step is to cut down on movement and rest as much as possible. In mild cases, compressing the area with ice wrapped in a towel for a few minutes twice a day can speed up the recovery. For severe cases, the individual may need pain relievers to become comfortable, and most of them are available at a local pharmacy. After the pain has subsided, it is important to exercise and lower the recovery time, but this has to be done slowly. Begin by performing simple stretching exercises and gradually increasing the intensity of activities. Jumping head first into physical activity at the first sign of recovery may cause the injury to re-open and take back the progress made. Most hip strains will heal within a few weeks to a couple of months, sometimes with only regular rest. However, what comes afterwards is the most important part. While the pain may be gone, that doesn’t mean you’re out of the woodwork, you should still limit activities carried out around the affected area for a few months. Also, remember to stretch adequately before performing any exercises. Stay away from any kind of sport while you are healing as it can just make your situation even worse. The most advanced sports injury clinic and pain management center, Brooklyn pain management doctors and specialists at Pain Physicians NY offer unique, individualized approach to manage your hip pain. We are using the most effective pain management and treatment options including electrical nerve stimulation, Platelet Rich Plasma (PRP) and Corticosteroid Injections and utilizing the latest technologies available in USA.